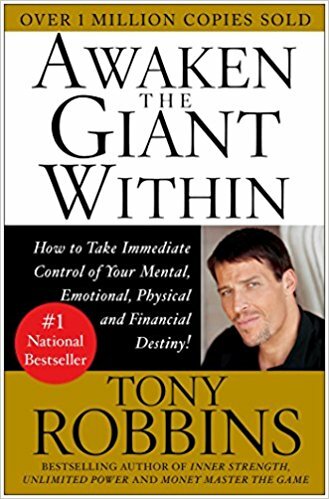 Any book on self-improvement or harnessing your own psychology written since this one is merely a footnote. You could forego every other pop-psych book, just read this one, and you’d be set. Write down all the pleasure you’ve experienced in the past by indulging in this negative pattern. Why does it feel good to put these things off? What short term pleasures are motivating you to ignore the long term pains? What will it cost you if you don’t change now? Be honest with yourself, what will it cost over the next month, year, decade if you don’t change this pattern. Write down all the pleasure you’ll receive by taking action on these right now. Get your brain to associate MASSIVE PAIN with the belief. Was the person I learned this belief from worth modeling in this area? What will it ultimately cost me emotionally if I don’t let go of this belief? What will it ultimately cost me in my relationships if I don’t let go of this belief? What will it ultimately cost me physically if I don’t let go of this belief? What will it ultimately cost me financially if I don’t let go of this belief? What will it cost my family/ loved ones if I don’t let go of this belief? “The second belief that you and I must have if we’re going to create long-term change is that we’re responsible for our own change, not anyone else. First, we must believe, “Something must change”— not that it should change, not that it could or ought to, but that it absolutely must. You have to know where you want to be in order to point yourself in the right direction. The only way we’ll make a lasting change is by creating a sense of urgency that we must change now. Use pain inducing questions like “what will it cost me if I don’t change?” to highlight the consequences. We can be highly motivated to change, but if we keep doing the same things and running the same patterns then nothing will happen. We’ll just get more of the same pain and frustration. We have to consciously choose the new behaviors that are going to replace the old one. What eventually leads to relapse for smoking, drugs, is usually a large amount of stress. Your brain cannot tell the difference between something you imagine strongly, and something you experienced. Create a schedule to reinforce and reward your behavior. How can you feel good each time you get it right? Whatever pattern of behavior is constantly reinforced will become habit. Anything we fail to reinforce will dissipate. Reinforcement needs to happen immediately after the behavior occurs. If your attempt didn’t work for fixing the behavior, then you need to go back to step 1. Are you crystal clear on why you want this and how much better your life will be when you do it? You need to develop a pattern of consistent questions that empower you. What am I willing to no longer do to make it the way I want it? Write down 3 disempowering words you use that make you feel lowsy, and three new empowering words that can interrupt the pattern and make you feel better. Find new empowering words to add to your regular vocabulary that can pump you up. What is life like? What metaphors do you use for life right now? Make a list of all the metaphors you link to relationships or marriage. Are they empowering or disempowering? Pick another area of your life that impacts you most, your business, health, family, and discover your metaphors for this area. Create new more empowering metaphors. For each area you’ve considered, strike out the old metaphors and create new, more empowering ones. Decide that you’re going to live with these new empowering metaphors for the next 30 days. Write down everything you’d like to improve in your life that’s related to your personal growth. Brainstorm for at least 5 minutes, don’t stop writing! Add a timeline to each of the goals, how long you want to give yourself in years to accomplish it. How much do you want to earn? What goals do you have for your company? What net worth do you want? When do you want to retire? When do you want to reach financial independence? What do you want to invest in? What do you want to save for? What kind of houses? Trips? Cars? Services? Experiences? “Step 1. Find out what your current values are, and rank them in order of importance. This will give you insight into what you want to experience most— your moving-toward values— and what you want to avoid most in your life— your moving-away-from values. It will give you an understanding of why you do what you do. It will also offer you the opportunity, if you’d like, to consistently experience more pleasure in your life by understanding the pain-pleasure system that’s already built within you. It’s a disempowering rule if it’s impossible to meet. It’s disempowering if something you cannot control determines whether it’s been met or not. What does it take for you to feel successful? What does it take for you to feel loved— by your kids, by your spouse, by your parents, and by whoever else is important to you? What does it take for you to feel confident? What does it take for you to feel you are excellent in any area of your life? Look at the rules and ask yourself if they’re appropriate, do they make it easy to feel bad or good? If necessary, change your rules so that it’s easy to feel good and hard to feel bad. Make a list of all the elements you want your identity to have. If you’d truly like to expand your identity and your life, then, right now, consciously decide who you want to be. Get excited, be like a kid again, and describe in detail who you’ve decided you are today. Take a moment now to write down your expanded list. Now develop a plan of action you could take that would cause you to know that you’re truly living consistently with your new identity. The final step is to commit to your new identity by broadcasting it to everyone around you. The most important broadcast, however, is to yourself. Use your new label to describe yourself every single day, and it will become conditioned within you.